Carnota has two claims to fame, the first is quite probably the largest horreo in Galicia and the second is its superb and massive beach. Carnota is located on the AC550 road that tracks a section of the Galician coastline running north from Ribiera to Corcubion. The town itself straddles this road and although of no significant tourist interest on its own, is undoubtedly worth a visit if you are a sun lover, or have an interest in unusual and historic structures. Left, a photo of horreo in Carnota. 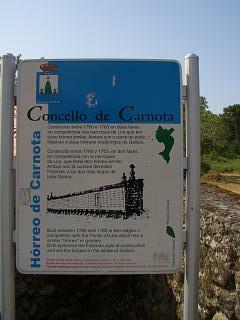 Once in Carnota there are signs for both the horreo and the beach (which has several points of entry). It is however the sign for the beach (or praia) that is the best, not just for the beach, but for the grain store as well. If you read any guide, or pick up any tourism leaflet about Galicia, you will almost certainly see a photograph of the long and narrow grain store (horreo) at Carnota. 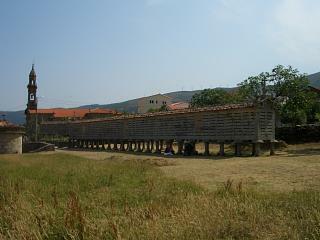 This particular horreo is claimed to be the region's largest complete and original example and it is many metres in length. Right, a photo of the horreoin Carnota. It is constructed entirely of the traditional local stone of granite and it stands on numerous stone legs. It has a width of about five feet and a height of about seven feet. It sits in a field next to a church and receives a steady flow of interested and intrigued visitors. Originally these grain stores were used to store and over-winter all manner of crops, but today they have been replaced by cheaper, larger and more cost effective alternatives. This is not to say that they are no longer built, but their construction now tends to result from their appeal as a piece of garden dressing and the newer examples are there for aesthetic rather than functional reasons. 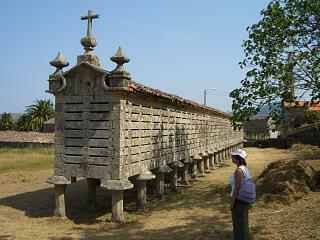 Left, the sign indicates the importance of this traditional Galician structure.